The Rod Bunch: Holiday FUN & Adventures!! This Thanksgiving was our first official turkey day that we were all together. It was truly amazing and filled with lots of love, food, craziness and more love. The first of many Thanksgivings yet to come. Fun with the beautiful Emma & Ella. The loving pair that is inseparable..
And to add to the adventures.. Enlai decided to play spider man on Thanksgiving day by jumping off the couch and he ended with a fractured elbow that ended up in surgery that day. 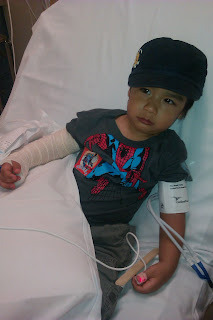 Aside from the fractured elbow he was pretty bummed because as he stated, " momma I tan't fly like spider man. (with a sad face)"
With cast and all he managed to continue smiling and without his right arm for 6 weeks. He did AMAZING!! We were blessed to spend Christmas and New Years in EL Paso this year enjoying loved ones, yummie food, and lots of fun!! Emma and Ellas first Christmas!! All the kids are growing so quickly! Poor Enlai, already has his first broken bone. That tends to happen to those dare-devil types. At least it was repairable and all is well. Everyone looked so happy and like they were having a blast. It looks like your holidays were just perfect with kids running around all over the place! Have a wonderful New Year filled with love, laughter, health, happiness and peace!